For prior parts in this series, see here. The latest round of the dispute between Hay'at Tahrir al-Sham (HTS) and al-Qaeda loyalists- prompted by a joint statement from Sami al-Oraidi and Abu Humam al-Shami (who belong to the latter camp)- has led to ever more voices chiming in on both sides. The latest of primary texts in this series is a text entitled "Six Issues" written by Abu Abdullah al-Shami, who will be familiar to followers of this dispute as a key HTS official and defender of HTS' project. Hereafter in this post, I will simply refer to him as Shami. Some of Shami's arguments are similar to ones made by HTS leader al-Zubeir al-Ghazi, though he also offers rebuttals to some al-Qaeda loyalist talking points raised against al-Zubeir al-Ghazi. - The weapons in HTS' possession belong to HTS, which is set as a red line. HTS' ownership of the weapons is logical and established through the ruling of Abu al-Khayr al-Masri (a deceased 'deputy' of al-Qaeda leader Ayman al-Zawahiri). The argument the al-Qaeda loyalists raise on this matter is similar to the argument Islamic State used to justify seizing property from Jabhat al-Nusra (the former al-Qaeda affiliate that evolved into HTS): namely, since the Islamic State claimed Jabhat al-Nusra was affiliated with it by virtue of having provided material support to it, seizing property from Jabhat al-Nusra was justified. - The calls for judgement and arbitration by certain mashayakh are fallacious. The issue of ownership of the weapons has already been settled. Even if the claimants had valid points here, one cannot appoint as arbiters of the case people who are hostile to HTS. - It is wrong to claim that HTS leader Abu Muhammad al-Jowlani cancelled the January 2018 agreement he struck with Abu Humam al-Shami. Rather, he realized Abu Humam could not get his group (what is now Hurras al-Din) to agree to it. Even if it were cancelled, the al-Qaeda loyalists still have no argument as the principle about ownership of weapons was already established. - The issue about the military council is not which personality will run it, but rather whether it realizes the desired interests in forming a more unified force and military structure to defend the 'liberated' areas. If anything, the al-Qaeda loyalists should participate in a military council to strengthen military capabilities and efforts. - Routes have in reality been open rather than closed (apparently, an acknowledgement that e.g. some commercial and civilian traffic has long been going on between rebel and government-held areas). HTS made its stance on the Sochi agreement between Russia and Turkey clear in an official statement. - HTS will not compromise on its principle of refusing to barter with the muhajireen (foreign fighters who have come to Syria). - The civil administration in the form of the Salvation Government does not mean compromising on implementation of the rule of God's law. Of these various points, I note with most interest Shami's discussion of the concept of the military council. He does not specifically deny that there has been a suggestion by some HTS leaders to have a military council headed by a Syrian military defector affiliated with the likes of Faylaq al-Sham (a Muslim Brotherhood-linked group that identifies as Free Syrian Army). Rather, Shami makes clear that the problem is that many of these al-Qaeda loyalists (particularly outside Syria) have no nuances about realities on the ground when it comes to things like 'al-Jaysh al-Hur' ('the Free Army'- i.e. Free Syrian Army). Indeed, Shami distinguishes between the Free Army and the 'National Army': the point being that since the latter (based in north Aleppo countryside, where the Turkish presence is much stronger than in Idlib and its environs) is a mere proxy of Turkey, it is unacceptable, whereas the Free Army groups in Idlib and its environs are not necessarily Turkish proxies and so it would not be inconceivable to work with them. In this regard, I do think Shami has a valid point here. But I also note two points on which one can fault Shami. While he says HTS issued an official statement on Sochi and one can refer to it in order to understand the group's position on it, that statement itself is not so clear cut. Another issue is that Shami suggests that arbitration of the dispute with al-Qaeda loyalists could be resolved through the Salvation Government's judicial system. This hardly seems fair though considering how bound the Salvation Government project is to HTS. Below is my full translation of Shami's testimony. Any parenthetical insertions in square brackets are my own. here are multiple different issues we would like to comment on in this place in order to clarify what some sides have stirred up through their statements and affirmations in recent days. 1. "The Weapons of the Commission [Hay'at Tahrir al-Sham]"
Let all- and the first of them a group previously- know that the arms of the commission are a red line we will not accept to be infringed upon by anyone (regardless of who he is) with claims of zhafar or the likes of them from claims that we hear today, and whoso comes near our weapons on any pretext will be dealt with as an aggressor against the wealth of jihad, and all who take it upon themselves to take some of these weapons under any pretext will be pursued, held to account and prosecuted. And Sheikh Abu al-Khayr (may God have mercy on him) had decided the issue and settled it organizationally, relying on the fact that it was settled from the Shari'i angle, such that one who asserts this doubt we hear today should not come out. And the affirmation that the arms of the commission belong to the commission comes naturally to the reasonable people, but we are before strange minds that mount the doubts on the basis of a group of premises- something that requires for them to be dismantled. Leaving aside the Shari'i, intellectual, conventional and logical affirmation, let alone the organizational affirmation that was established and ruled upon by Sheikh Abu al-Khayr (may God have mercy on him) regarding the issue, detailing the affirmation that the arms belong to us through refuting the claims of the people and dismantling the false premises from which they have come to the conclusion of their strange assertion requires extended explanation. For among its requirements is discussing again the issue of allegiance pledge, its type, adaptation of what happened and the ijtihad in it. In addition, one must discuss the organizational affiliation in the light of the interests of jihad, its intentions and objectives, as well as other necessities that will take up lengthy space. Whatever the issue between us and al-Qaeda- may God grant it success- we broke ties in an organizational and Shari sense, and we performed ijtihad in realizing the interests of the jihad of al-Sham, while observing the issue of allegiance pledge. And we are still on the stirrup of jihad- we ask God for steadfastness- and our allegiance pledge in origin is an allegiance of jihad and not an allegiance pledge of an imamate. This means that the end goal for which the allegiance pledge came as a means of realizing it has been the interests and intentions of jihad, for the allegiance pledge should not be an impediment on the way to that, as it is a means and not an end in itself. And even if we suppose the truth of all that the claimants assert, these weapons are the property of the group and not al-Qaeda. And if al-Qaeda had given us any material components of arms and the like- with assessment of the support and moral components- it is its right to demand judgement, and at such time, let the door of litigation be open. As for arriving from the issue of the previous allegiance pledge- which was broken within ijtihad, organizational and Shari'i circumstances- to the assertion of al-Qaeda's ownership of what is under the hands of the commission today, that does not differ as a fatwa from what was used to condemn the Dawla group [Islamic State] regarding its interpretation of the fatwa of al-zhafar and establishing it on the same wrong defect: namely, that the Jabha [Jabhat al-Nusra] was affiliated at the time with the Dawla group organizationally, on the basis that the Dawla group had sent a group of material components, even though we had given them back- at the time- in the form of twice as much. And we make clear to whoso stirs up this issue now: these weapons are the property of the commission: that mujahid group that still bears a Sunni jihadi project however much the attackers attack, and if they attack our jihad and devise the lie against us that we have abandoned the jihad in order to arrive from it to the assertion of the transfer of the ownership of weapons to them, this methodology is not far removed from the methodology of the Dawla group when they were appropriating our weapons yesterday. And we were waging jihad in Sharq al-Sikka as well as before and after it through the likes of these weapons while these claimants were dissuading the mujahideen from that fight through pretexts. We will ask them about them- they and whoso authorized for them to do so- before God Almighty. - We have made clear above that the issue of our ownership of the weapons is settled, and there is no space in it for the likes of these tactics in the name of arbitration through court and the court. - Even supposing acceptance of the case in this issue, there is the Ministry of Justice that is established in the liberated areas, ruling by the law of God Almighty, and all can seek arbitration through it, and established upon it are a group of the competent Ahl al-'Ilm wa al-Jihad, who have religious authority and trust, bringing together- with knowledge and jihad- acquaintance with the details of the reality of the field here. So whoso wants to raise any case, let him go ahead, and there is no need to transfer every small and big thing from issues outside the field, with due respect to all. - The issue of the weapons was previously included within the agreement signed by the brother Abu Humam, and it is tantamount to confirmation and acceptance of what Sheikh Abu al-Khayr (may God have mercy on him) established from the commission's ownership of the weapons in its hands. And the fact Abu Humam was unable to bind his group by the agreement is well-known to all. In any case the issue is binding for the people. And we have no relation with their problem that is between them, and that problem does not mean that were we to reject reopening the issue, we will have rejected resorting to arbitration of court and implementation of arbitration and ruling as some have promoted (those whose adversity is not hidden) and the people, even without Abu Humam's signature, are obliged to fulfil what Sheikh Abu al-Khayr (may God have mercy on him) established. When Abu Humam's group rejected the agreement after the man signed it in his capacity as delegated, they met and making accusations against him in what the agreement contains from Shari'i violations as they claimed!! Such that he said to the Shari'i officials at the time: consider for me and investigate, for perhaps I have committed a cause of kufr [disbelief] in this agreement without knowing!! And after Sheikh Jowlani was convinced that Abu Humam could not ratify the agreement in light of the obstinacy of his group, he said to him words to the effect of: the sheikh does not want to incapacitate Abu Humam, meaning; if you are unable and the agreement won't be implemented, the matter becomes taken for granted, and the agreement will not be implemented. That is, that the impediment to implementing the agreement is the inability of Abu Humam, and not the sheikh releasing him. As for plain matter of releasing, I asked Sheikh Jowlani: did you release them? He said: I do not recall that I released them. Even supposing release, this means that the conciliatory agreement of 16 clauses has been cancelled, and the matter has returned to the origin that it was before: i.e. the arms of the commission are its property, and it is the Shari'i ruling in the issue and according to that Sheikh Abu al-Khayr (may God have mercy on him) wrote his document in which he affirmed that what is in the commission's hands from arms and the like are its property, in order to prevent the arising of doubt. 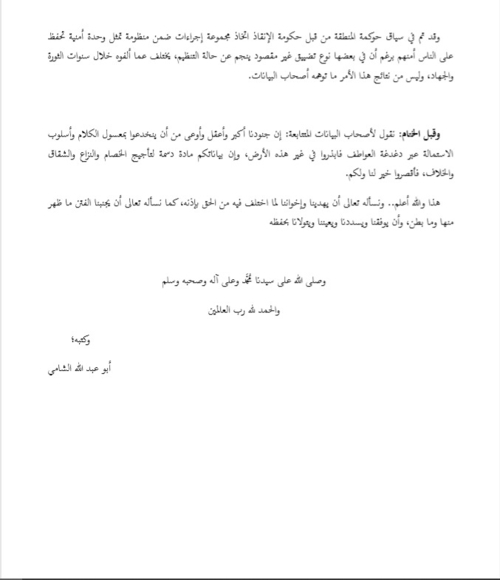 For Sheikh Jowlani wanted to reconcile with the people through some compromises as is the case in some of the clauses of the 16-clause agreement so when they rejected the matter, and the sheikh became certain of Abu Humam's inability to implement it, he spoke in terms from which the people understood release, and if correct the conciliatory agreement is cancelled and the matter goes back to what it was before they suggested that doubt. - The group surrounding Abu Humam- and they had not announced Hurras [al-Din] back then- rejected implementing the ruling of one of the dear mashayakh, whom they demand to implement ruling today after Abu Humam had agreed to it through signing. - Some of the mashayakh- whose names have been featured in the statements pointed to: the level of their adversity with us, their accusations against us, their rebukes and attacks against us, our religion and our manhaj reach such a degree as to exceed the people of the statements themselves. So how can we accept someone as ruling and judge when he is a staunch adversary accusing us in our religion and manhaj?! Indeed we are the ones who must prosecute him for his falsehoods against us and his attacks on our religion. And of the last to be in the place of one of the suggested judges to rule between us and the people has been the one who has accused Sheikh Jowlani of standing behind the killing of the two distinguished sheikhs Abu al-Khayr and Abu al-Faraj (may God have mercy on them both), in a clear accusation of treachery against the mujahid sheikh Jowlani (may God protect him)!! Then they accuse you of rejection of resorting to ruling if you don't accept this fair judge. The issue of developing the offensive and defensive operations room present in the liberated areas in order to be a military council or the like- and the lesson is in facts and not names- is an issue suggested since not a short time, and its objective is to unify the efforts to defend the liberated areas and reinforce them. And this was before the recent developments, and there is no doubt that those developments impact the aspect of laying down the foundation as it has been suggested, and the criterion for applying it or otherwise depends on two issues. First, the possibility of implementing that practically and the benefit of it according to what the situation permits. Second, the interests realized from this, and they are clearer than for the eye of the follower to miss them. And it is appropriate for the people of statements to bear from the burdens what is compatible with the size of their statements, and it is appropriate for them likewise to deal with the issues with a responsibility far removed from media attacks that many master. And the liberated areas require more exertion of effort and mutual support of those efforts, not more media statements. And it is not among those criteria for us that it should please this side or that, let alone that it should be a request from it, but these are the delusions and obsessions of some, which make them- on account of how much they imagine- confuse truth and delusion. And like this is the issue of handing over the command of the council to so-and-so leader and so-and-so: for the criterion of that is the realization of what is in it from bringing together the force and what is in it from the interest of defending the liberated areas, and not realizing the desires of this side or that. And we will not proceed to adopt a step we do not consider to be in the interest of the jihad and its people by God's permission. And we ask the Almighty for granting success and the right path. Then what is the practical way to realize the bringing together of the force or something of that, in the minds of these people in the shade of the current reality? Or is it that unity of force- even if in any form- must remain in the world of slogans beneath the world of reality?!! And we in this context call on these brothers- in their capacity as leaders of their group- to join the united operations room (or which we hope will develop to a higher level if possible)- independent of its naming- so that they may bear something of their Shari'i obligation in protecting the liberated areas, and can see with their own eyes that this gathering is something God loves and is pleased with. And we advise in this context those who are outside al-Sham and spending hours commenting on what occurs in al-Sham. We say: check yourself, for in al-Sham among the complications is that in which man must hesitate and not hasten lest he become victim of his hastiness. For whoso does not distinguish between the name of the Free Army and the name of the National Army [an 'army' of Syrian rebels based in north Aleppo countryside that is essentially a Turkish proxy], despite the clarity of the difference between them, how can he judge on those complicated details?!! Then indeed detailing the issue of the Turkistani [Uyghur] brothers in the form that he has conceived- the one we wish to advise- has reached the point of oddness through his distance from the reality!! We say in short and without detailing: the reality is that these routes have been open for years and not closed, even if not operating in their natural form. And the position on Sochi we have previously clarified in an official statement, and we are concerned with our statements only. 5. "Handing over the muhajireen"
If the one who speaks on this means the states, the states have their statements and they are and what they have entailed, and we are not concerned with those statements. But if he means the commission- in statement or allusion- then let him know that we do not do something that does not please our Lord. And we consider it forbidden to hand over the Muslims to the disbelievers, and we have clarified this in our manhaj multiple times, and no one can attack us on this. And the muhajireen are our brothers and we do not see a difference between a muhajir and Ansari [local Syrian fighter], and our throats are beneath the throat of the one who has migrated to us, and we will not allow bartering on their portfolio in any circumstances, for besides the fact that it is in contravention of the Shari'i principles, it is far removed from Islamic ethics and chivalry. 6. "Civil proceedings in the liberated areas"
From the aspect of the civil administration, all know that the commission was interested in the issue. Since the academics launched their initiative and the foundational commission was formed and the Salvation Government arose from it, led by people of competence and trust, in so far as we reckon, the directive has been to hand over all that concerns issues of administering the liberated areas to this government, and to work on separating the military aspect from the civil aspect in that each side works on its speciality in a foundational and integral sense, bringing good to the liberated areas and their people. And this government has announced with all clarity its adoption of the law of Islam, its instructions and rulings- without anything besides it- as the reference for it. And the liberated areas that are under its authority have been connected with a unified system for administration in the different civil, judicial, security and policing aspects, as they provide services to the people according to capability, while the courts spread in the general mass of the liberated areas cover the need in this aspect, and likewise the security and policing system that watches over the security of the liberated areas, protecting it from their enemies from agents of the regime, the Khawarij, sowers of corruption, the kidnappers and the like. And in the context of the governing of the area by the Salvation Government, a group of measures have been adopted within the a system embodying unity [/unit?] of security that protects the people's security despite the fact that in some of it there is some unintentional restriction [/harassment?] that results from the state of organization, differing from what they have been accustomed to during the years of revolution and jihad. And it is not among the results of this matter what the people of statements have imagined. And before concluding, we say to the people of consecutive statements: our soldiers are greater, more intelligent and more aware than to be deceived by sweetening of words and the method of winning over through tickling of feelings, so disseminate your seeds elsewhere besides this land, and indeed your statements are oil to kindle the dispute and conflict and disunity and disagreement, so fall short. That is best for us and you. This is so and God knows best. We ask the Almighty to guide us and our brothers in what disagreement there has been from truth by His permission, just as we ask the Almighty to keep away the fitnas from us both open and internal, and to grant us success and make right our path and aid us and assume responsibility over us through His protection. God's blessings and peace be upon our Sayyid Muhammad and his family and companions. Written by Abu Abdullah al-Shami.